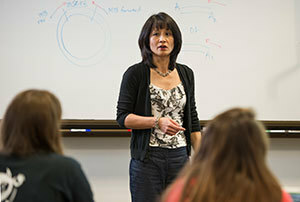 Michelle A. Whaley, a teaching professor in the Department of Biological Sciences at the University of Notre Dame, has been named the 2014 Indiana Professor of the Year by the Carnegie Foundation for the Advancement of Teaching and the Council for the Advancement and Support of Education (CASE). She will be announced as the award winner at a luncheon Thursday (Nov. 20) at the National Press Club in Washington, D.C. This is the first Indiana Professor of the Year Award for a Notre Dame faculty member. Dennis Jacobs, a former Notre Dame faculty member who is now provost and chief academic officer at the University of Santa Clara, was named one of four overall CASE/Carnegie Professors of the Year in 2002. Whaley, who joined the Notre Dame faculty in 1993, earned her doctorate in molecular genetics from Notre Dame. Her doctoral work characterized a gene involved in Drosophila (fruit fly) visual system development that, when mutant, causes adult retinal degeneration. Whaley’s research is currently focused on the characterization of Aedes aegypti mosquito visual genes and how gene expression may affect mosquito behavior. Many undergraduates have participated in her research during her Notre Dame career. Her previous work was in the visual system of Drosophila, and she still uses this system to study mosquito genes in transgenic flies. All her research is done in collaboration with Joseph O’Tousa, a Notre Dame professor of biological sciences. Her teaching has focused on developing critical thinking and research skills in students early in their careers. She teaches three main research-based courses: Junior and Senior Honor Research seminars; Molecular Genetics Laboratory, which is a semester-long research project; and Cell Research, which is a two-credit independent study research course. She also directs the summer Research Experience for Undergraduates (REU) program in the Department of Biological Sciences and has received 16 years of continuous National Science Foundation support for her summer REU Program in Molecular and Cellular Biology. The program trains undergraduate students from across the nation at Notre Dame during the summer. A particular emphasis of the program has been on training students from underrepresented groups, with usually half of each summer group consisting of minority students. Whaley is the faculty coordinator of the Undergraduate Research program in the Department of Biological Sciences and the chair of the Undergraduate Research Committee, a group of mostly tenured faculty who develop policy and opportunities for undergraduate research in the department. Whaley has also been instrumental in developing a series of novel initiatives that engage her department and the College of Science with the local community and school districts. She created and leads the Genetics Mentor Program for middle and high school youth at the Robinson Community Learning Center and was instrumental in bringing to Notre Dame the DNA Learning Center following her visit to the Cold Springs Harbor Laboratory, where the program is centered. Whaley has received multiple teaching awards from Notre Dame, including two Joyce Awards for Teaching Excellence and three separate Kaneb Teaching Awards. This year, a state Professor of the Year was recognized in 31 states. CASE assembled two preliminary panels of judges to select finalists. The Carnegie Foundation then convened the third and final panel, which selected four national winners. CASE and Carnegie select state winners from top entries resulting from the judging process. Whaley was selected from faculty members nominated by colleges and universities throughout the country.